A beautiful sunny day in Offenburg as the women set out. 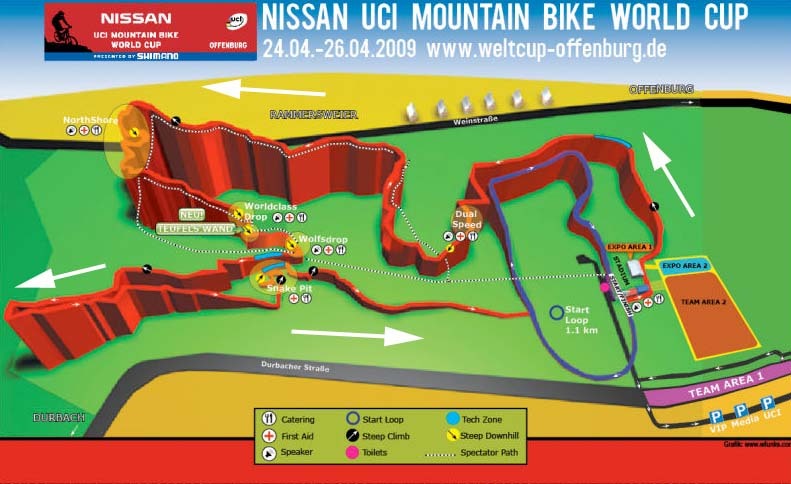 They will do a start loop plus 6 laps of the course. The Women have just completed the start loop with Katrin Leumann in the lead. Marie-Helene Premont (Team Maxxis-Rocky Mountain Bicycles ) and Catharine Pendrel (Luna Pro Team ) have moved up from there start position of 5th row to top 40 spots. 5:50am: Coming down off the climb and passing through the techzone, Fullana's lead is extending with Osl and Byberg at 50 sec followed by Pendrel, Kalentieva and Ren. Emily Batty now into the top 10 with Premont in 12th. Lap 5: As they start the lap Fullana with chase group of 3 (Ren, Pendrel, Byberg) at 46 seconds. Kalentieva and Osl still together at 51 seconds, Lechner 7th, Koerber 9th, Schneitter 10th, Batty 11th, Anna Szafraniec (Jbg-2 Professional Mtb Team ) 12th, Premont 13th, Georgia Gould (Luna) 14th, Mary Mcconneloug (Kenda Seven) 26th, Amanda Sin 37th, Mical Dyck 54th, JeanAnn McKirdy 55th.